Hello HCPSS Parents! The Council of Elders is very proud to announce the continued efforts to recognize the academic achievement of our HCPSS students! Below is the list of the upcoming celebrations. We look forward to seeing our students and celebrating their hard work at our events! TCOE is happy to announce another fundraiser! Grotta Pizza is supporting a TCOE fundraiser on November , 2018! Simply print the attached flyer and enjoy a great meal! As a non-profit organization, all monies raised by TCOE supports the families and students of Howard County! We look forward to seeing everyone! TCOE is a non-profit organization! Everything we do as an organization focuses on giving back to the Howard County community and the students who attend HCPSS Schools! Glor Days Grill is sponsoring a fundraiser to support the efforts of TCOE from October 11, 2018 through October 18, 2018. Simply print the flyer and follow how you can support! Your family will enjoy an awesome meal and part of the money spent will be donated to support the efforts of TCOE! It is a WIN-WIN! Hope to see everyone there! Welcome to a new academic school year. TCOE is proud to continue its partnership with HCPSS with presenting Community Academies! 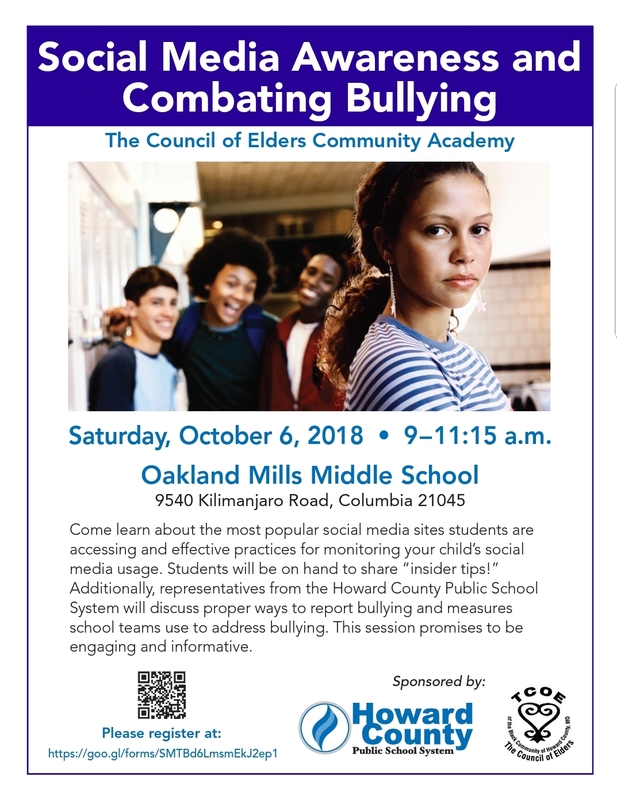 The Council of Elders, in collaboration with HCPSS, will be holding their first Community Academy of the 2018 – 2019 school year on Saturday, October 6, 2018 at Oakland Mills Middle School. The academy will start at 9:00am and end at 11:15am. This topic is so very important as it brings attention to the different forms of bullying, which are not limited to peer-to-peer. Below is the link to register for the event and the flyer with additional information regarding the academy. TCOE encourages you to share this information to other HCPSS families. We look forward to seeing as many families October 6th! . (Please copy and paste link into browser if unable to open). TCOE's annual "Celebration of Excellence" event, honoring African American seniors in the Howard County Public School System who have maintained a 3.0 - 4.0 GPA throughout their high school career, was held on Wednesday, April 13, 2016 at 7pm.